Starting this month, Facebook will be making it easier for users to see how their personal information is utilized for ad targeting. 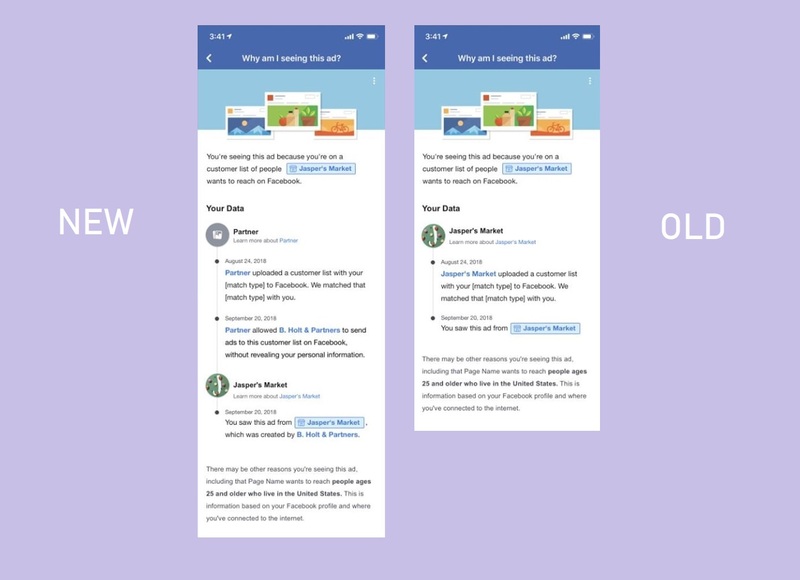 According to Facebook Advertiser Hub, the users will soon be able to see new information by tapping on the ‘Why am I seeing this ad?’ icon that emerges alongside the online advertisements. Previously, the “Why am I seeing this ad?” interface had only details about the brand that purchased the ad and the basic demographic details. As of February 28, it will also show the dates when the contact information was uploaded and when it changed hands. This, basically means that users will now be able to see the date on which the brand uploaded their contact information on Facebook along with the time it gave the ad agency access to the details. Moreover, the users will also be able to see when the ad was served to them. By introducing this feature, Facebook aims to make users more aware of how their data is used on its social network. But how did the brands obtain their personal information in the first place will remain a mystery to the user – for now! The new “Why am I seeing this ad?” dialogue box will be rolled out to all Facebook users from February 28. Throughout 2018, we introduced several changes to Custom Audiences from a customer file focused on additional accountability and transparency - including the introduction of new requirements for Custom Audiences built from a customer file. Following last year's commitment to continue improving transparency in ads targeting, starting on February 27, we will surface additional information to help people better understand why they are seeing certain ads when Custom Audiences are used. Specifically, we will be updating the “Why am I seeing this?” explanation that can be accessed from the top-right of any Facebook ad. Soon, when a shared Custom Audience from a customer file is used, the “Why am I seeing this?” explanation will surface the name of the business that uploaded the user's information to Facebook and highlight any Custom Audience sharing that may have taken place. This may include involvement from agencies, FMPs, or other partners. However, there will be certain modifications when an agency or FMP establishes an “on behalf of” (OBO) agreement between one of their ad accounts and their client's business. Please note that our Custom Audience Terms remain unchanged. We hope these updates will help ensure more accountability and transparency from advertisers, while still enabling businesses to advertise efficiently and effectively.